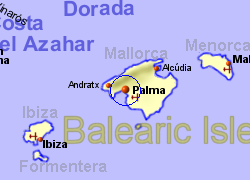 Palma de Mallorca is the capital city of the island of Mallorca and is also an important port, sitting in a wide sheltered bay. The city has a number of notable buildings which attract tourists including the magnificent cathedral built in the 13th and 14th centuries, the Royal Palace of La Almudaina built in the 14th century on the site of a former castle, and the silk exchange built in the 15th century. The 14th century Bellver Castle located on a hill 3Km north of Palma is unusual due to being circular with circular towers. 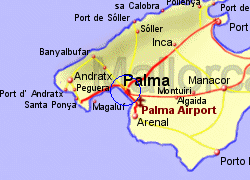 Palma has a metro rail link running 6km north to the University at Sa Garriga, and also a train link into the centre of the island (though not to the airport). 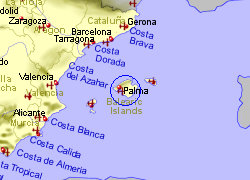 Map of the Palma de Mallorca area.